Zakynthos Travel Guide: 10 most popular activities on Zakynthos island! Zakynthos island is the perfect summer destination. There are not only unique beaches and breathtaking views, but also plenty of pleasant activities you can try. Below we present you the most popular and interesting ones! Boat trips are popular with children and adults. 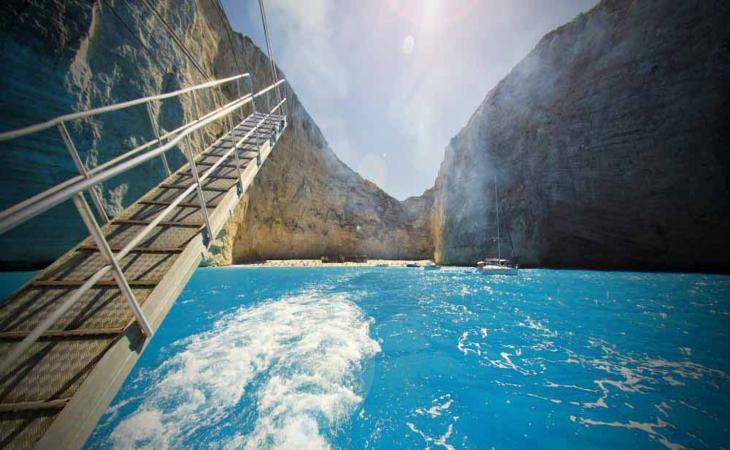 It is the absolute must for the visitors of Zakynthos island or ''Il fiore di Levante" as it is called by many. 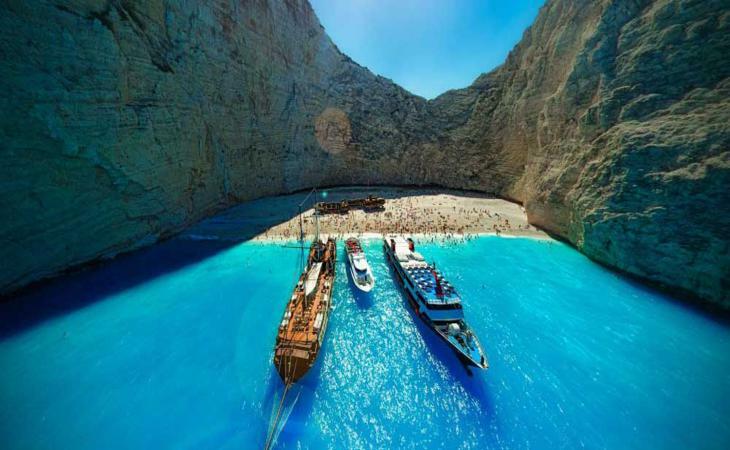 The boat trip to Navagio and the blue Caves is very popular as Navagio is famous around the world. Every year thousands of tourists come to the island in order to see the wreck and swim in this unique sea water. The boats run to Navagio every day, the prices are affordable and you can take the tour from May to beginning of October if the weather allows it. A popular boat trip is visiting the Marathonisi island located in Laganas Gulf. This specific boat trip is ideal for young children as they can observe the turtles in their natural habitat. Also swimming in the Keri Caves is an unforgettable experience because the blue-green sea water is deep and crystal. There are some sea caves which can be explored with goggles. Life jackets are provided to those who are not experienced swimmers. The island tour by boat is recommended to the visitors who come to Zakynthos for a short time. The round lasts about 7 hours giving you the chance to see the most important sights of the island like Navagio, the Blue Caves, Keri Caves, Marathonisi and all the beautiful beaches of the eastern part. Snacks, sandwiches, coffee and soft drinks are served at the snack bar of the boat. We recommend you to have a sun tan lotion and hat as it is not sure that you will find a seat at the indoor deck. The trip is particularly popular. 2. Ride on a train- guided tour! An amusing experience perfect for all ages! 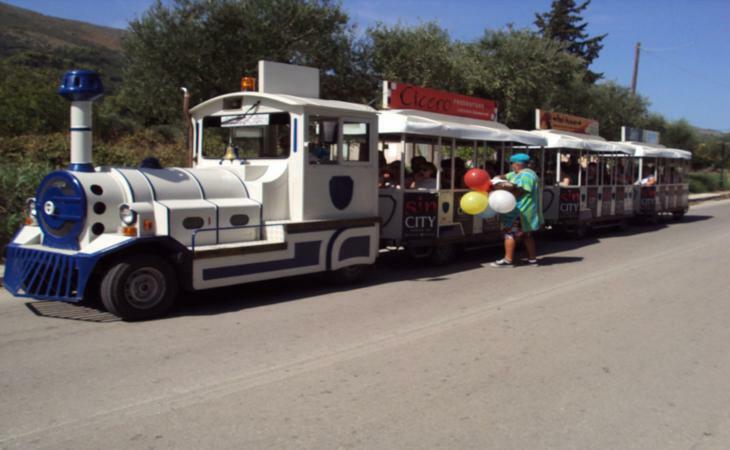 There is a train ride together with guided tour that takes you to the most important historical Ζakynthian sights. The train sets off from Zakynthos town, goes up Bohali hill, past the castle, Stranis hill, Solomos monument and reaches Argasi. The tour is especially interesting for the history lovers. A more traditional train rides sets off from Alykanas and Alykes, goes to Katastari and the villages of the region there. On this ride you will have the chance to see the olive trees and the panoramic view above Alykanas and Alykes. 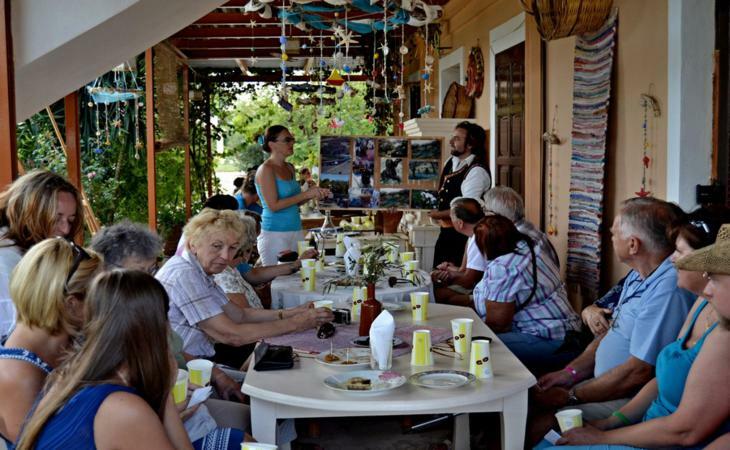 The trip includes lunch in a traditional tavern while Pigadakia, the Vertzayio Folklore museum and the church of Saint Panteleimon are seen during the tour. The sun, the sea and the water sports is the magical combination that will make your stay on Zakynthos island an unforgettable experience! Zakynthos island is full of beautiful beaches where you can enjoy the sun and the sea.The adventure lovers can also try some water sports. Not all the beaches are available for that kind of activity as several of them are part of the National Marine Park and thus protected. Below you can find the beaches where water sports are available. Alykanas beach (northern & eastern part) you can choose among jet ski, hydro jets, windsurfing, sea pedal, canoeing and paragliding. Kalamaki beach ( southern part) only canoeing and sea pedal are allowed. Tsilivi beach (eastern part) you can try jet ski, sea pedal, canoeing and paragliding. 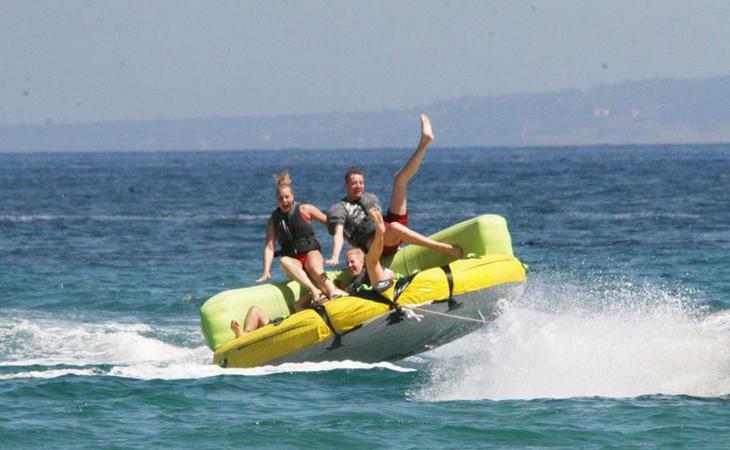 Banana beach (southern & eastern part) in this beach there is a wider range of water sports choice like: banana, flying fish, U.F.O, jet ski, paragliding and more. Free transfer is provided in a private bus from Laganas, Kalamaki and Argasi if you have already booked a game. The above activities may differ depending on the demand. One of the most amusing summer activities is the water slides! Tsilivi (eastern part) . There are 7 different water slides, a water jungle, a pirate ship and a pool especially constructed for children at the Tsilivi Water Park. Kalamaki (southern part) The visit at the Caretta's Fun Park will be an unforgettable experience as children and adults can have fun all day. 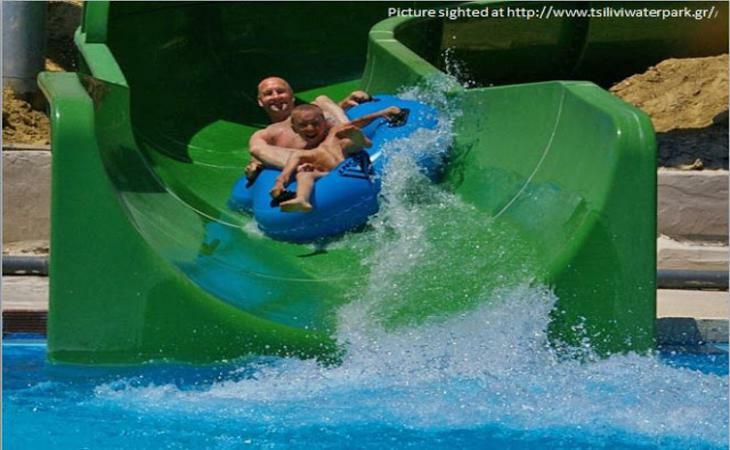 Have a go at the water slides, the lazy stream and the ''wavy'' swimming pool. The snack bar situated close to the water park serves snacks and drinks. The ideal choice for children and adults who love horses and nature. Zakynthos is an island with rich vegetation ideal for hiking. Also horse riding is recommended, addressing to children and adults, either for beginners or experienced riders. You can ride among olive trees, take pictures and stop at places with breathtaking view. A more popular activity is swimming on horse back. 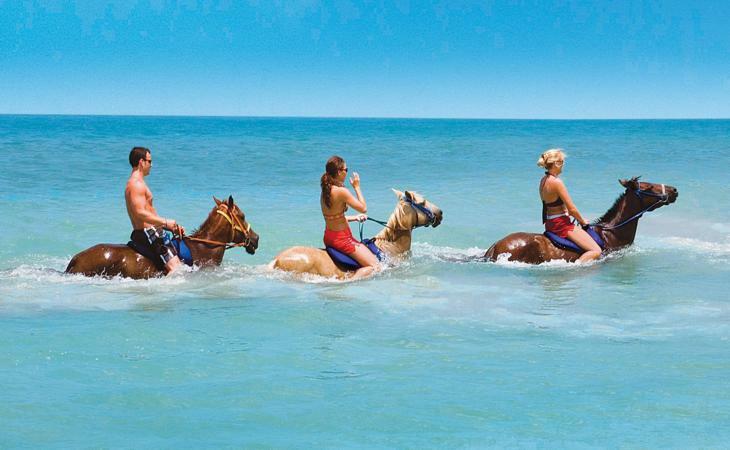 At the end of the route the instructors take you to a quiet beach where you enjoy a 15-minute-swim on horse back, an experience that will be unforgettable. 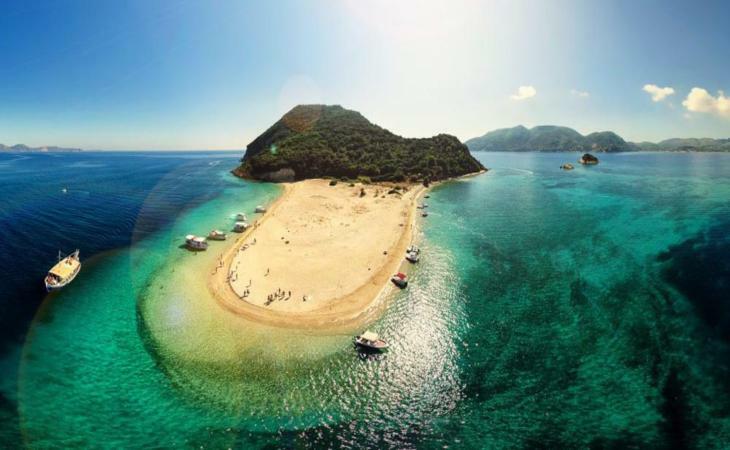 Explore the magic sea bottom of Zakynthos island! Diving is a popular activity on Zakynthos island. 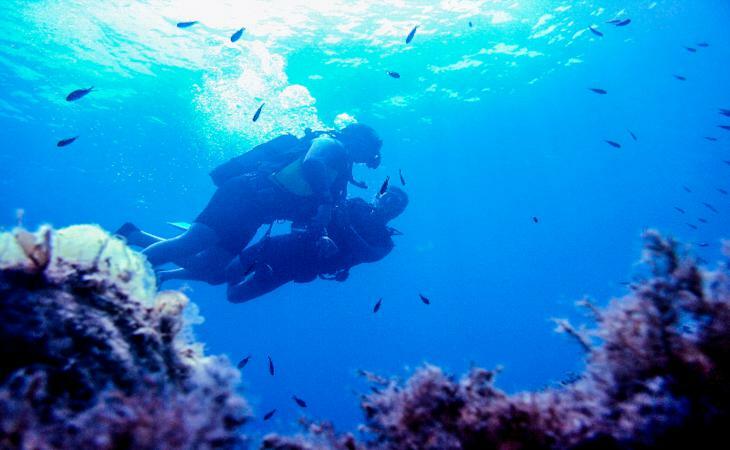 There are scuba diving centers in Laganas, Tsilivi, Alykanas, Argassi, Limni Keri and Vasilikos. We, as locals suggest to dive in Keri Caves and Marathonisi. The beginners can try out snorkeling or the ''try dive''. At first you get a short training and the diving equipment from the diving center then you are transferred to the place of diving in comfortable boats. During the diving an experienced, certified scuba diving instructor escorts you. Visit a Zakynthian farm and see from close the traditional life style! There are several farms on Zakynthos island open to all. Visitors can see the way of producing the olive oil, the wine and the cheese and even participate in the process of grape pressing, feeding the animals and collecting olives. 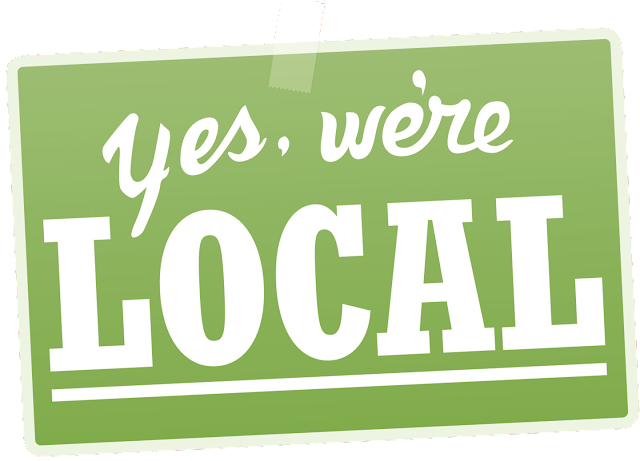 Most of the farms have guest houses where you can stay or small shops where you can taste and buy local products. An especially interesting activity is ''cooking with the locals'' in which you learn how to make traditional Greek dishes like aubergine ''skordostubi'', ''kolokithokeftedes'' (zucchini balls), rabbit in red sauce, all cooked with pure home produced goods. At the end of the lesson you enjoy the meal you have prepared with your 'teachers' gaining an unforgettable experience. Come and dance with us, share our "kefi", taste delicious geek food! 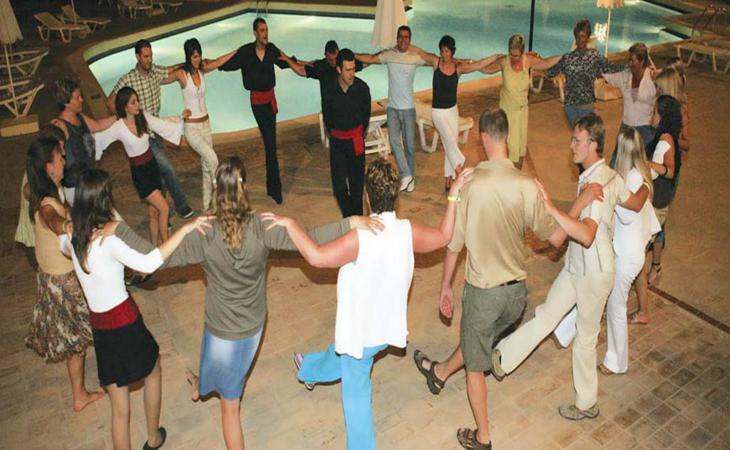 Dancing and singing could not be absent from Zakynthos island. Lots of visitors wish to see how the Greeks have fun, listen to traditional music and why not dance. A typical Greek night includes a meal, local wine and of course lots of singing and dancing. Depending on the month the Greek Nights begin at 20:00-20:30. 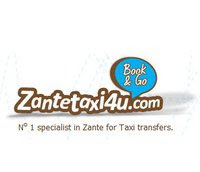 There is sometimes free transfer to the tavern or the hotel that organises the Greek Night. At first dinner is served together with wine. Children can have some juice or a soft drink with their food, then singing from local singers begins followed by plenty of dancing. Usually the Greek Nights finish at about midnight and you return at your accommodation. The absolute relaxation and revitalization of body and spirit in luxury spa centers with experienced staff. On Zakynthos island there are several spa and beauty treatment centers where you can spoil yourselves with a beauty session. Herbal products and lotions with exotic spices will detoxify your body and give shine to your skin. 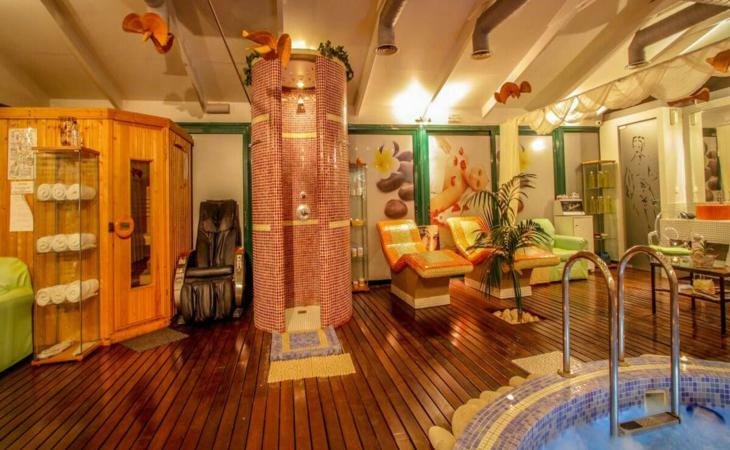 We suggest you to try jacuzzi, thalassotherapy, sauna, feet massage, relaxing massage, peeling, olive oil treatment. Spa facilities are situated in the large hotels of the island in Laganas, Kalamaki, Tsilivi and Tragaki.